How often should I race? Having a race out there can be really motivating, to the point that runners always want a race out there in the future. How far in the future is the key. Understanding your body is the deciding factor. You need to know how long it takes your body to recover from a particular distance and difficulty. This has a lot to do with your training, genetics, and eating habits. Your goals are the second factor to consider. Why are you running a particular race? To reach a personal record, to socialize with like minded individuals, to get fit/lose weight, or to support a good cause or a good friend. Runner’s who are not trying to get a personal record at every race, can run more races than runners who go out there and leave it all out on the course. It takes longer to recover from a hard run, and if you want all put your absolute best into all of your races, you should choose two or three goal races a year. Four if they are the 5k or 10k distance. 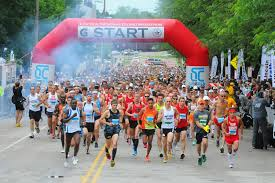 If you are running races just to be around other runners or support a good cause, without any real regard for your time you can run a race every month, maybe even more often if you are running under the half marathon or are doing a variety of distances. If you are pacing/supporting a friend who is slower than you are it shouldn’t affect your ability to run another race shortly afterward, unless it is a longer distance than what you would normally run. Running frequent races can be helpful when trying to lose weight. I would not run more than one every other month and then the pace goal should be just to finish the race. As you lose weight your will get faster and feel better during and after the race. Having a race every eight weeks, will help keep you motivated to get out there and train. There are a million races of every distance out there and it can be hard to choose which ones to run because you want to do them all. How frequently you can run a race, depends upon your body and your goals.